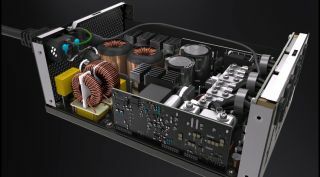 Cooler Master is banking on there being an audience of system builders willing to fork over more than $1,000 for a special edition power supply, one that is manufactured in Japan and built exclusively with Murata components. The folks at TechPowerUp snapped a few pictures of the MasterWatt Maker 1200 MIJ (Made in Japan) at CES, which apparently is the culmination of three years of development by 40 engineers. There is also a video going around. "The best power supply we've ever made," Cooler Master states. Cooler Master also refers to the special edition PSU as the MasterWatt Author ME 1200W. Either way, you're looking at a 1,200W unit with an 80 Plus Titanium rating, meaning it hits efficiency levels above 94 percent (Cooler Master claims it's above 95 percent). It also supports Bluetooth for accessing certain features through Cooler Master's mobile app. While details are fairly sparse, Cooler Master says it plans to build a few thousand of these things, each priced at over $1,000. Cooler Master also announced a 1,500W version of its MasterWatt Maker series. This one is not a limited edition unit, though Cooler Master does consider it a flagship model, a designation that conflicts with the special edition PSU being the best its ever made. Anyway, it packs copious power, an ARM-based digital signal processor, a next-generation 3D circuit design, Bluetooth support with the ability for users to toggle between the default +12V multi-rail or single-rail modes, and a 7-year warranty.